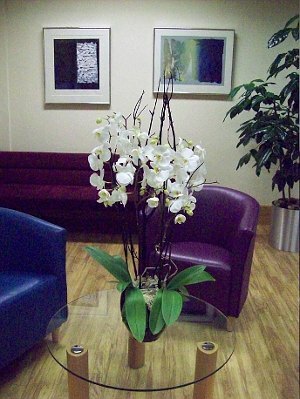 Decorfolia news - What is the big deal about office plants? What’s the big deal about office plants? - by Oxford Botanica. Do the plants in your building give people a buzz or bore them rigid? How can you tell? Your own opinion of what you look at is a good start. If your reaction is "wow that's impressive" or " this room looks attractive", then it is reasonable to assume that the plants are creating a good impression. The reality though, is that you probably do not even notice them as they have become part of the furniture or are inconsequential. Alternatively, your plants might have become so insignificant because they are not growing - they have been induced into a state of inertia and cease to impress. The current state of the interior landscape industry is such that many clients are getting very poor value for money. This has partly arisen as a direct result of the system of Facilities Management being undertaken by "third party" companies. These FM companies are faced with the task of outsourcing the various "service" contractors and in most cases they have to be competitive in order to keep the contract. This often leads to the supply of "lightweight" plants which, although cheap, fail to make any impression in the space to which they are allocated. Furthermore, the maintenance service is often reduced to a quick watering and a possible swipe of the plants, commonly known as "splash and dash". 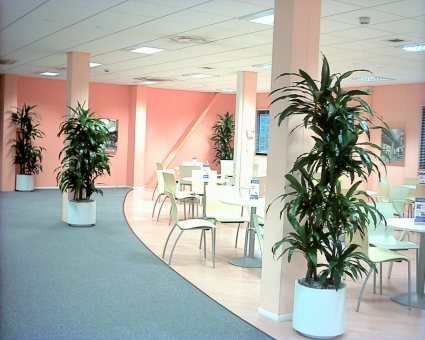 As a result the client company is left with plants that sit still, fail to produce new leaves and take on a dull appearance. You can make your own assessment of the calibre of the maintenance staff by seeing what they carry with them. More often or not, it is only a watering can and a black bin bag for dead leaves. Is this what you deserve? What about secateurs, fertiliser, sprayers for leaf shine and pest control and clean cloths for wiping the leaves? How much plant knowledge does the maintenance staff actually have? Does the contractor offer a wide choice of interesting and unusual plants? A company worth it's salt will probably show a good range of plants, both tall and slender, as well as bushy or spreading in habit. Do they offer flowering plants and do they feed on a regular basis and what pest and disease control is exercised? Monitor the maintenance staff to see if they have the appropriate equipment and supplies to fulfil these disciplines. It is encouraging to discover that there are a number of contractors who are more horticulturists than decorators, more practitioners than salesmen. They take pride in their job and ensure that an interesting selection of plants is installed in your premises and, furthermore, that the plants' rate of growth is actually noticed and appreciated. They would make it their business to ensure the maintenance staff really cared about the plants and were not doing the "splash and dash" routine. The whole purpose behind interior landscaping is for the plants to enhance the environment and create a sense of well-being. Plants have a softening effect on the austerity of modern architecture, not to mention their beneficial effect on air quality. Plants and flowers add interest to what may be deemed to be rather uninteresting office spaces as they stimulate both the visual and emotional senses. It is important therefore, that the appointed contractor deals with this as an actuality and not as polished yet empty assurances.